The 73650 Lifetime basketball backboard is a great introductory level system. The ShatterGuard name is also known as Shatter Proof. 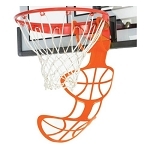 This basketball backboard comes with an Orange Slam-it Rim Basketball Set. This Fusion Backboard Combo Unit has Replaced Model #3778 Lifetime Basketball Backboard Replacement. The backboard for Lifetime 73650 44 Inch Shatter Guard Backboard and Rim Combo is one of the most cost-effective acrylic Lifetime replacement backboards. The frame, including the mounting uprights on the back of the backboard, are made of polyethylene plastic. The 73650 comes with a 5-year factory warranty from Lifetime Products for customers in the United States and Canada. The 73650 is a backboard and rim combo, which includes just a backboard and rim. The mounting bracket and Mounting Hardware is not included with this package, but are sold separately. If you are ordering this Lifetime basketball backboard as a replacement backboard for your existing system, please contact us first to verify compatibility. 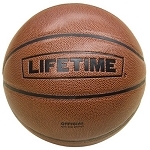 Competitive Edge Products is an authorized dealer of Lifetime basketball products. Material of construction: EM5 Acrylic. Backboard Pad included - made with Polyethylene plastic. Slam-It rim: Constructed of solid steel with 1/2 inch braces and welded steel hooks. Slam-It rim uses a double-spring compression mount to the backboard. 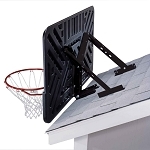 This backboard can be attached to a pole or wall using the 1044 Adjustable Height Basketball Mounting Bracket, or to a pole or wall or roof using the 9594 Fixed-Height basketball mounting bracket. Comes with a white, all-weather net. This backboard is good for both indoor and outdoor use. The backboard frame, including the mounting uprights on the back, are made of polyethylene plastic. 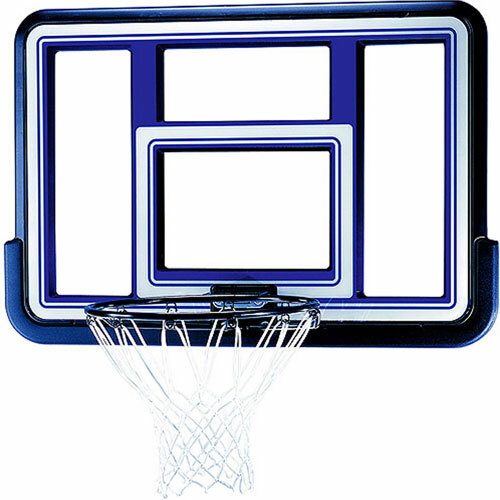 These Lifetime Basketball Backboards Feature Fade-Resistant Graphics. Rim size: regulation, 18 inch diameter. All-weather net weight: 70 g.
Overall backboard weight: about 27 lbs. Easy checkout, fast shipping. Pleased with transaction. Very nice backboard. Thanks for the great product ... Fast shipping and great customer service!!!!! Great product. Great communication. Great overall transaction. I was very happy with the product. I was a bit hesitant when I ordered it but it came fast and installed easy and quick. The best part was getting to prove my nay-sayer wife wrong when she said that I would never get it done and probably would not do it right. 1/2 hour after I started, we were shooting hoops! Q: Can you buy the backboard and it can replace a broken backboard or do you have to buy the backboard with the rim? A: This is only sold as a combination kit. We do not carry the backboard separately. Feel free to contact us with any other questions. Q: I presently have a Lifetime Elite 50" basketball hoop. It fell over in a wind storm and appears to have bent something when it landed on its rim. The rim is now bent slightly upward from the force of the impact. I want to replace this rim and/or backboard. From your experience what do I need to do? Is it salvageable? Everything else (base, pole and adjuster) appears to be working okay. A: If the actual rim is bent you can get a replacement. However, if the plate where it attaches to the backboard is also bent-and it's actually somewhat common if the basketball system falls hard-then you will need a new backboard and rim. Getting a new rim may help, but if the place where it attaches to the backboard is bent, then the rim will still slant upwards or downwards depending on how it fell. Fortunately, we do carry lifetime backboard and rim combination replacements. Q: How does it attach to our current pole? A: It attaches to the current pole with bolts there is an instruction manual for this backboard. Q: I have a lifetime basketball backboard I have a part number of CB01400-1? Q: The only number I see on my Lifetime goal outfit is #1129023 90204. I need a replacement backboard for it. Will your # 73650 44 be compatible? A: Yes, it would be compatible with your existing system. Feel free to contact us with any other questions. Q: Is the combo rim and backboard # 73650 the same as the model # 73621 but only 4 inches bigger? A: They are different models, though they are very similar. They have the same type of backboard, rim, and warranty. Q: Is the Lifetime model # 73650 backboard and rim available? A: I show 1050 available as of this morning. Q: Does this backboard and rim serve as a replacement for lifetime model #1512? A: Yes, it is compatible with model number 1512. Feel free to contact us with any other questions. Q: Would the replacement backboard 73650 44'' fit with a Big Spalding 53'' backboard We bought the big Spalding 53'' with a hole in the backboard. It's okay to play as is but we'd like to see if we cold put the smaller backboard on it. Could you make it so the kids could use it with a 44'' rim and combo? Q: Will this backboard/hoop replace the Lifetime backboard # CB01400-1 (number found on the back of the backboard)? It is a Lifetime goal system mounted in concrete. The current backboard has shattered (the "Plexiglas" portion). A: Please call 1-800-225-3865 to check compatibility. Q: Do you sell backboards only without rims? A: You will need to call 1-800-225-3865 to get just the backboard. Q: I can not find info on the mounting kit that is sold separately how much and the part number? A: If you are looking at the description of this product simply scroll down and there is a big chart that tells you which brackets are compatible with this backboard and rim. The brackets that are compatible as model 1044 and model 9594 on our website. Q: What Bracket will work with this backboard? A: The 9594 and the1044 will work with this mounting basketball backboard. Q: Is the rim permanently attached, or is it shipped in pieces and then attached? A: The backboard and rim ship disassembled, and will need to be assembled when you receive it. Q: I have Lifetime product 1226113 1269. Will this replacement backboard work with this pedestal and pole? A: Yes, this will work with the pole and bracket that you already have. A: Unfortunately this will not work with the 1126113 basketball system. A: Yes, this will work as a replacement backboard and rim combo for the 1269 basketball system. Q: What is the backboard made of? A: The frame is plastic polyethylene, backboard material is polycarbonate, and the rim is steel. Q: Will this fit Model # 1533? A: Yes, it will fit that model just fine. Feel free to contact us with any other questions. A: Backboard thickness: 1.99 mm. Backboard frame thickness: 2 inches. Backboard dimensions: 44 inches W x 30 inches H.
Q: I have a Spalding backboard that disintegrated from the sun, It is post mounted. Will I be able to use all my existing mounting hardware on your backboard? A: Unfortunately, Lifetime is not compatible with existing Spalding brackets and hardware. You will want to contact 800-558-5234 to determine what the appropriate replacement backboard is for your setup. Q: I am looking for a net and backboard to replace a broken one that was attached to a 4 inch wide pole cemented into a parking lot. Does this unit come with mounting hardware that can work with that? A: This would not come with everything you need out-of-the-box. In fact, even the brackets that are available do not mount to a 4 inch pole, but only to a 3 1/2 inch pole. I'm sorry for the bad news. Q: will this fit model # 1542? A: Yes, it does fit that model 1542 just fine. Q: Is this a suitable replacement backboard for the Atlas 1558 model? A: It is definitely compatible, but if you have an Atlas model then your backboard is 52 inches wide. This is 44 inches so it is smaller. It will fit though. If you're looking for something that is 52 inches you might consider model number 90087 which is also 52 inches. Q: Does this fit on lifetime cb01400-1? A: I don't quite recognize that model number, that might be a part number, but this will fit if your existing basketball system is a lifetime brand unless it says "elite" or "mammoth". If it uses the power lift adjustment system to raise it up and down (the hydraulic lift) then it will not fit. If it uses a different type of handle that is not hydraulic, then it will work. A: Exactly the numbers molded into the back of mine. Can't understand why the Lifetime system does not recognize it. I would return it and trade upward, but it was a gift and wouldn't want to embarrass the relative who gave it to me. A: Where did you get that part number? Do you currently have a lifetime brand backboard? If so, it will likely fit unless it says "elite" or "mammoth". Q: What mounting brackets can I use for this backboard? A: Lifetime Sports Equipment basketball backboards and combo sets are compatible with the mounting brackets model 9594 non adjustable and 1044 adjustable basketball hoop mounting kits. The basketball hoop mounting kit is not included with this unit but is sold separately. We also carry other Lifetime basketball replacement backboards and Basketball Goal Hardware and Accessories. Q: What type of rim does this backboard have? A: This backboard has a Slam-It rim. This rim uses two springs when mounted to the backboard and holds up well to aggressive play. Q: What is the difference between acrylic and polycarbonate backboards? A: When comparing acrylic and polycarbonate for backboard materials, to be accurate, you need to compare backboard materials of comparable size. So, between two backboards of the exact same dimensions, the acrylic backboard would be more stiff, providing a better rebound. The polycarbonate backboard would have a bit more give, thus weakening the rebound, but have a longer life due to its ability to hold up well when exposed to sunlight. Fast Shipping: Orders for the 73650 Backboard and Rim Combination Kit generally leave the warehouse the next business day. Simply hang onto the original packaging and contact us within 30 days of receipt if you are not satisfied with this product. We will have the item picked up at our cost and refund you in full. We are that confident you will love this product. Dimensions: 44" x 33" x 6"